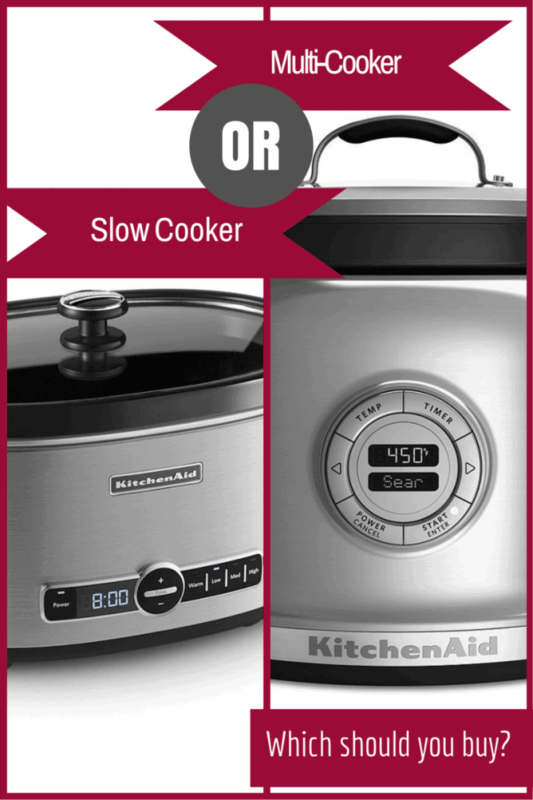 Slow Cooker vs. Multi-Cooker – what’s right for you? 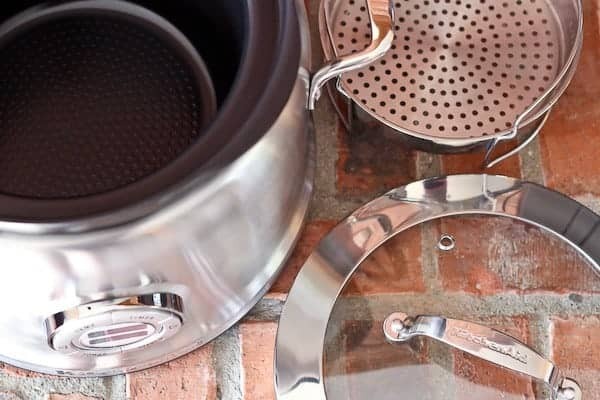 Slow Cooker vs. Multi-Cooker – which countertop appliance is right for you and your family? This guide will help you decide! I swear, there is a new kitchen gadget popping up every day. They’re all shiny, they all serve a purpose, and they’re all very tempting. If only I had a 1,000 square foot kitchen, all my dreams would come true. Or at least my kitchen dreams. I was recently sent a KitchenAid Multi-Cooker for the purpose of a review, and I have already gotten so much use out of it. 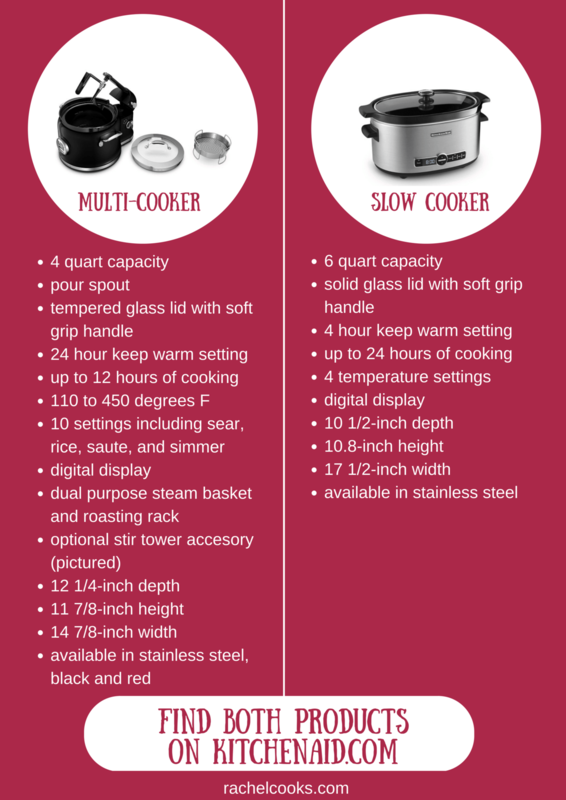 Since many people aren’t familiar with the Multi-Cooker, I wanted to compare it to a similar (yet very different) small appliance, the slow cooker. There are a lot of differences between these two countertop appliances. 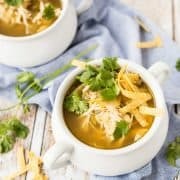 Most people are already familiar with the functions of a slow cooker – it’s a great hands-off way to get your dinner (or breakfast!) on the table with very little effort. 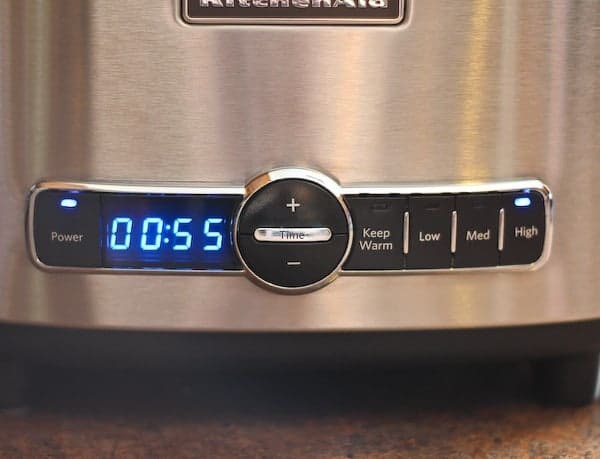 The one thing that sets the KitchenAid slow cooker apart from the crowd is its handy “medium” setting – something that gives you much more control over your slow cooking. Read more about the KitchenAid Slow Cooker here. What you might not be familiar with is the Multi-Cooker — a jack of many trades (and a master of all of them!). It comes with a steamer basket that converts to a roasting rack. You can also purchase a stirring tower attachment that will actually stir your food while it cooks in the multi-cooker. 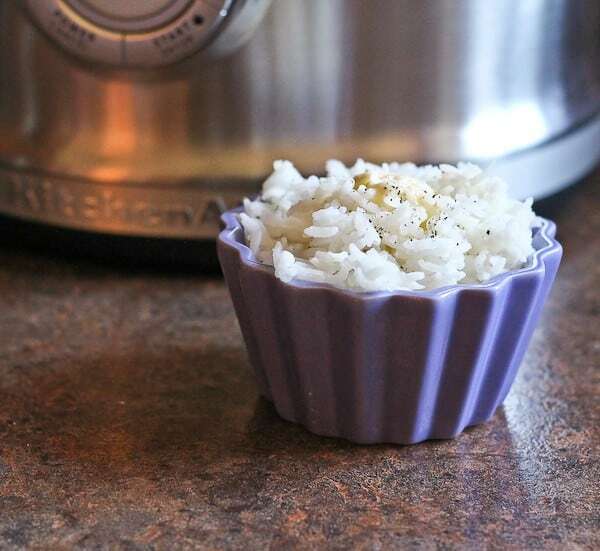 Risotto just got a whole lot easier! And it can be used as a kitchen timer when it’s not cooking something. That function, along with its pretty appearance makes this a front-runner for being left out on the counter! Read more about the KitchenAid Multi-Cooker here. 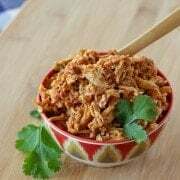 Slow Cooker: The benefit of the slow cooker is its larger capacity. It’s perfect for groups and large batches of recipes. 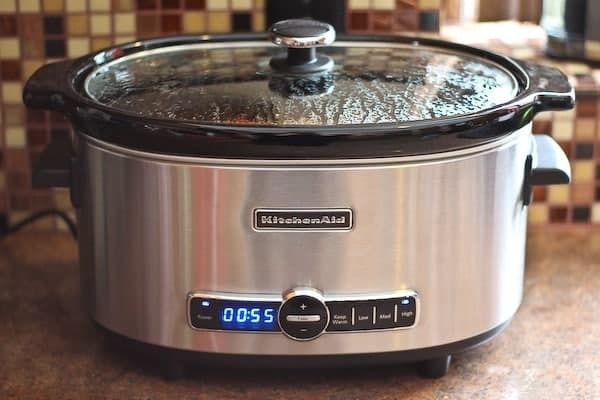 The KitchenAid slow cooker is great because of the availability of the “medium” setting and also because it automatically goes to the keep warm setting after cooking is done. Multi-Cooker: I’m smitten with this thing. I love that I can sear, saute, and simmer all in one appliance. And it makes the most perfect rice (I can never get rice right on the stovetop). The icing on the cake is the nonstick coating on the pot and the appearance of the multi-cooker. It looks great in my kitchen. Some yummy cheesy potatoes that will be making their appearance soon. Seared meat for and then slow cooked this beef and green beans recipe. Browned meat and vegetables for spaghetti sauce and then simmered it in the multi-cooker for a few hours. Steamed fresh broccoli using the steamer basket. Made rice (quite a few times!). I don’t know if I’ll ever make rice on the stovetop again. If you have a small family (4 or less), I’d recommend the multi-cooker. It does SO much and you’ll find yourself constantly using it. Or if you already have a slow cooker, I’d recommend picking up the multi-cooker to add to your collection. You’ll love it! If you cook for a larger group or attend a lot of potlucks, I’d recommend the slow cooker for its larger capacity. Disclaimer: I received free products from KitchenAid for the purpose of this review. I was not compensated monetarily and was not required to write a positive review. All opinions are always my own. Hi Rachel, thanks very much for writing this article and the advice you give. 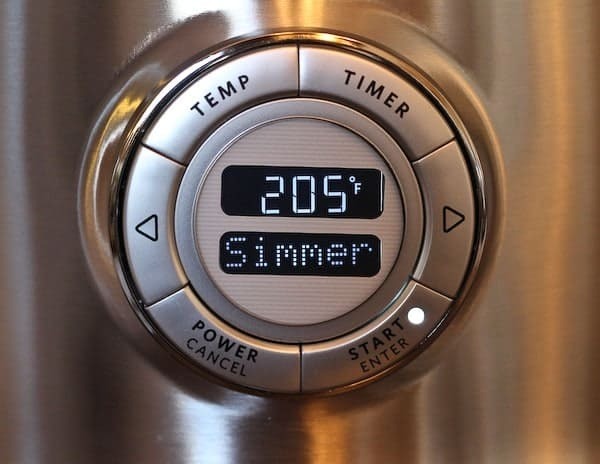 I have a multicooker that has “Long cooking” and “Fast cooking” options, amongst many others. Do you know if the “long cooking” would correspond to slow cooking? The manual is very basic and doesn’t say much about the different options, and I looked online for more instructions on the manufacturer’s website but not much either. I’ve only ever used it to sear, sauté, and pressure cook. Because every multicooker is different, I can’t find instructions for mine in particular and I’m not sure how I can use it to its best capacity. Thanks in advancevance for your time. Interesting! Yes, I would guess long cooking would correspond to slow cooking. That would be my best guess! Can you make stews, soups and the “traditional” foods make in a slow cooker but in the multi cooker? What about roasting a chicken in the multi cooker? Please advise as I will only buy one of these products. Leaning toward the multi cooker, as it seems to do the same but more! Thank you!!! Yes, you can! It’s a bit smaller than the traditional slow cooker, but it does have slow cooker settings. If you were only buying one, I think the multi-cooker would be a great choice! Thanks a lot for your nice explanation about this two kitchen appliances, It was really helpful. Thanks a lot! I’m so happy to hear that it was helpful! Thanks for taking the time to come back and leave a comment! Great review but what i wanted to ask you was that can i use slow cooker recipes in a multi cooker? Will the result bw the same? Absolutely! There is a slow cooking function on the multi-cooker. Thanks for the question! 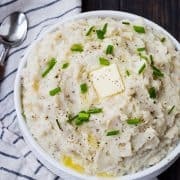 Hi, I just have one question about the multi-cooker. What is the inner container that the food cooks in made of? Is it the ceramic/pottery material that traditional slow cookers are made of or is it a metal/nonstick kind of thing? It’s a much lighter nonstick metal material. I am drooling at the possiblilies, even though I only have myself to cook for most of the time. I am anxious to know how much they cost. I have lots of Kitchen Aid products, So I know they are pricey but really worth the cost. I got my Kitchen Aid standing mixer right when a store was going out of business. Lucky on that one! Of course I would like to win a Kitchen Aid Multi Cooker. I enjoy your blogs Rachel. Thank you so much! I agree, they are absolutely worth the cost. Much better than buying appliances year after year to replace broken ones. I agree- great review! I want the multi cooker am drooling over it! Has functions I would use daily! It’s showing for me. Sometimes it doesn’t show up on mobile devices – try going to the menu and switching to “desktop view.” That should work. If not, shoot me an email and I’ll provide you with an alternative way of entering. Thanks! Hi Rachel – I really enjoyed the review. I would be sold on either one based on the KitchenAid name. I own a multi-cooker myself (different brand) and enjoy the versatility since I have a tiny kitchen and usually just cook for myself. I like how this KitchenAid has the different temperature settings. My mind is made up. It’s a multi cooker for me. I like all the things it can do. Great review. Rice not made in a rice cooker. Amazing! What a great review and comparison. Really appreciate it. I guess I am more incline to the Multi Cooker after reading your post as I love all those functions! (I do wish I have the counter space for both though!) Can’t wait to try out this beautiful product in my own kitchen. :) Thanks for hosting the giveaway.